In our LG G3 review and on the DL Show, I talked a bit about how I thought the QHD display presented colors a bit muted and somewhat washed out, especially when compared to the LCD or AMOLED used in the One (M8) or Galaxy S5. While I wouldn’t call that a deal breaker or even an issue you should worry about, it would be nice if there were some settings to adjust the color to your liking, similarly to how Samsung allows on the GS5. Thankfully, there sort of is. As reader thedanks pointed out in the comments of our review, under accessibility settings, LG has built-in a color contrast adjustment tool. By enabling the setting and then dragging around the on-screen circle, you can manually tweak the way colors are presented on your device. 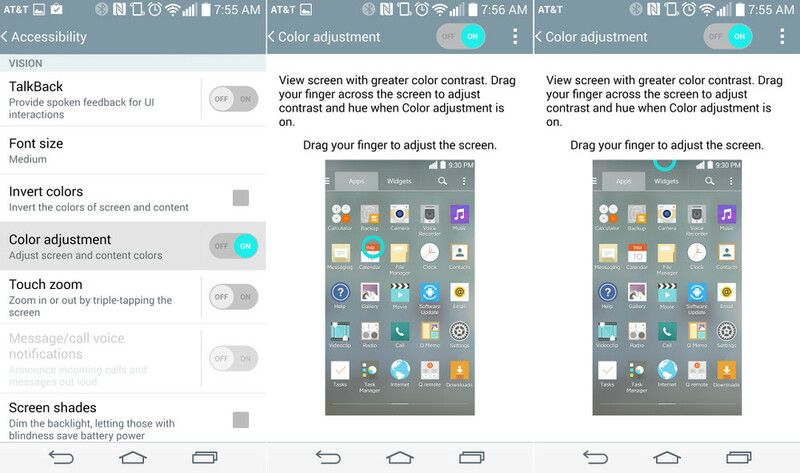 The screenshots do not represent the color changes, but you will quickly notice on your G3 that if you move the circle off to the left or right, you can adjust the colors your display shows dramatically. As also mentioned in the comments, leaving the circle just above the camera icon seems to be a good spot with just the right amount of contrast that adds a little bit of a color pop. To access this setting, head into Settings>Accessibility>Color adjustment.